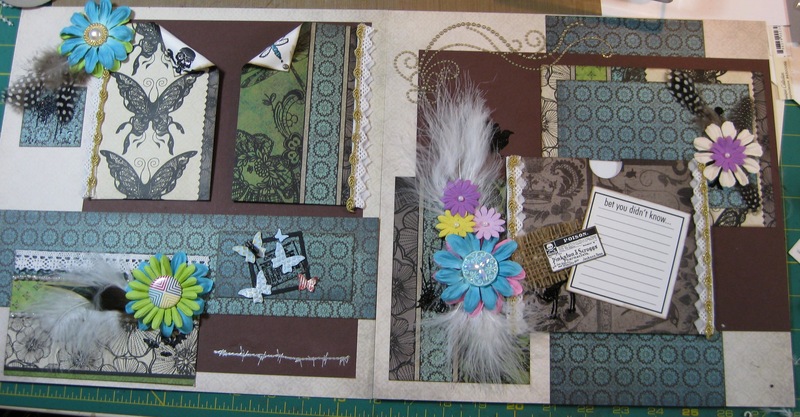 Assembly line card front creations. 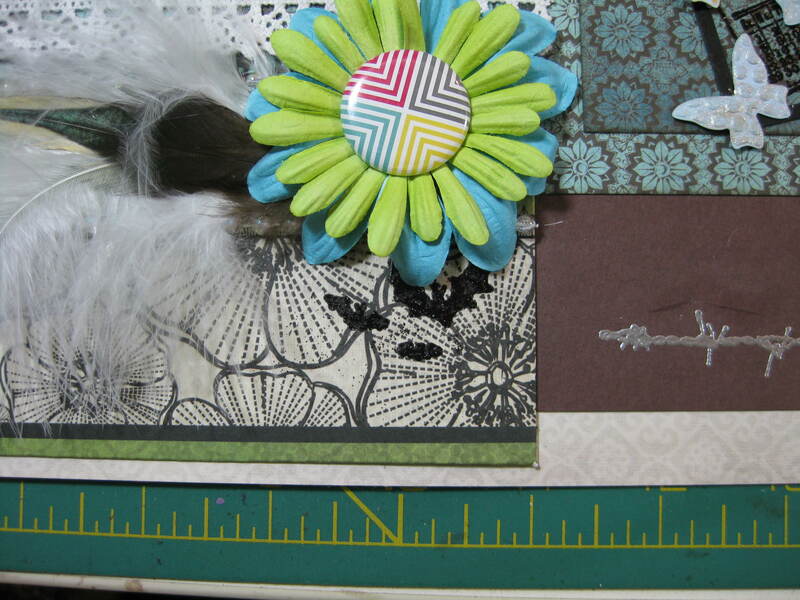 I am going to be making 16 cards for the stationery box I made yesterday. 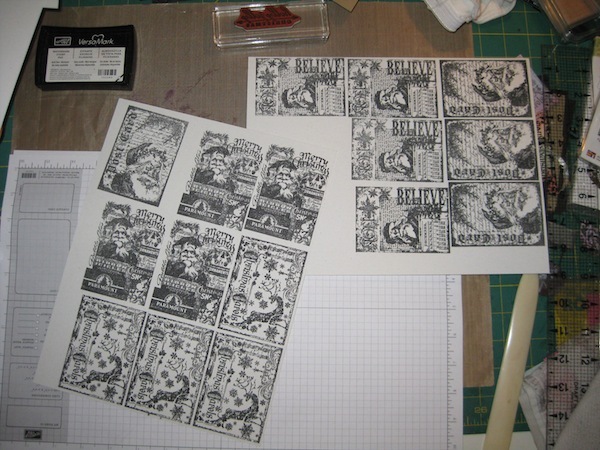 Once I had a “theme” for the cards I figured the best way to go about this project was to do it “assembly line” style. Getting the pieces made as I go along and putting them together in stages. 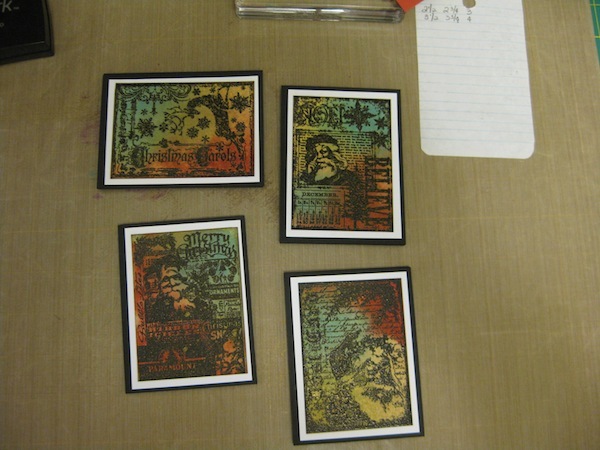 The stamp set I have chosen is the Tim Holtz Stamper’s Anonymous “Holiday Collection” with all the Santa images. The lighting in my room is pretty bad today and I apologize for the bad lighting. 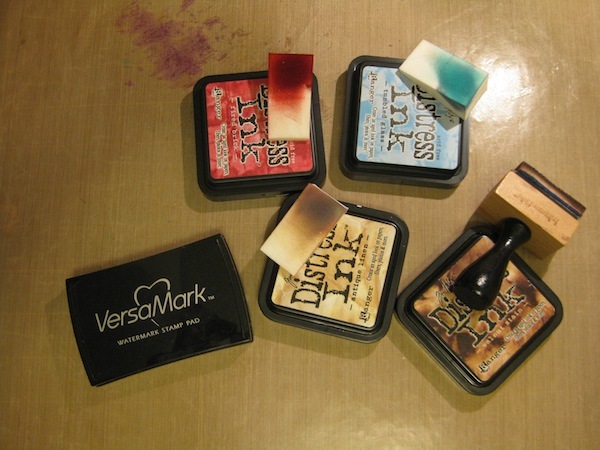 I’ve used VersaMark on these stamps and applied them to some paper I have had forever. 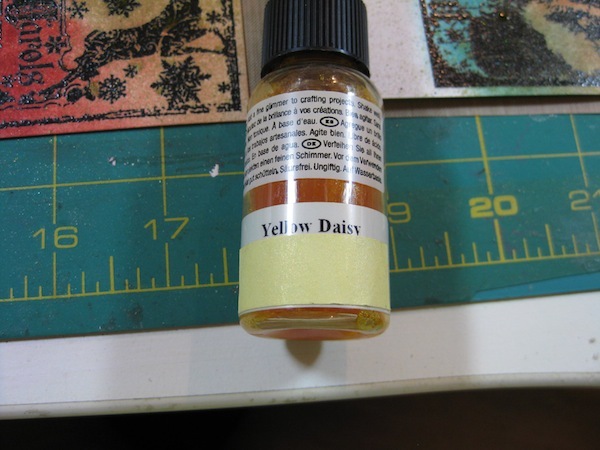 I don’t know what the brand is or anything….other than it is off white with some flecks of color in it. 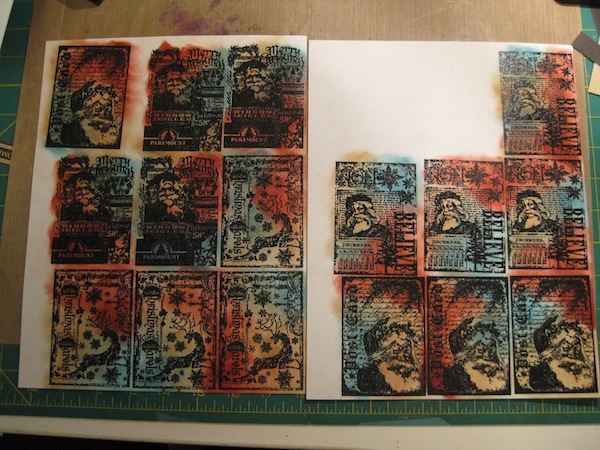 After stamping each image four (4) times I covered the VersaMark images with black embossing powder. This part of the project took about 45 minutes to an hour. 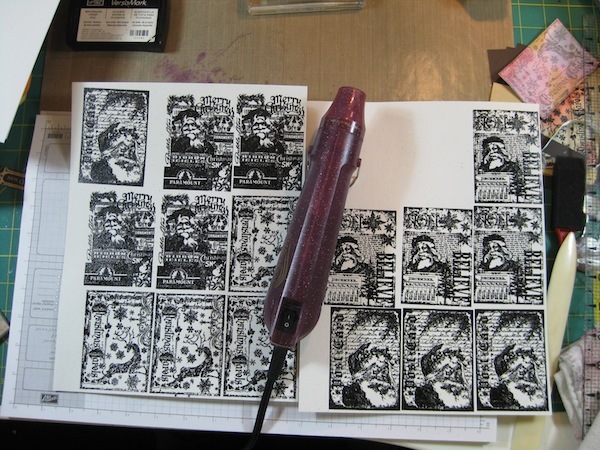 Inking the stamp, aligning it next to (but not on top of) the next image, then applying the black embossing powder. The most difficult part was trying to keep track of invisible. The VersaMark disappears once applied to white paper and it was pretty hard to see. 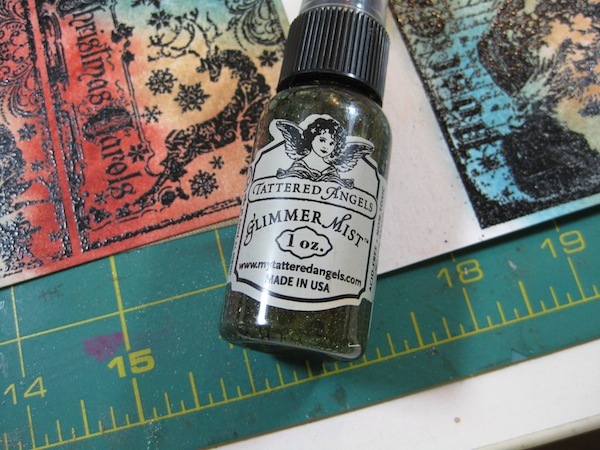 I would not recommend stamping the image one at a time then applying the embossing powder just to keep track of where you had stamped. 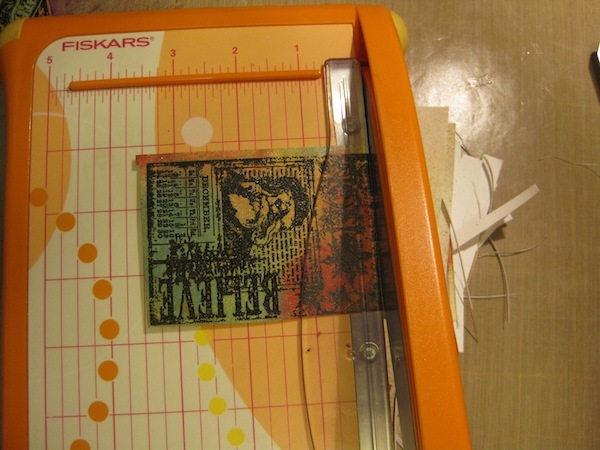 That fine powder, even tapped off and blowing the extra off, leaves a residue on the paper that is hard to see and leaves voids when you try to stamp over the fines. 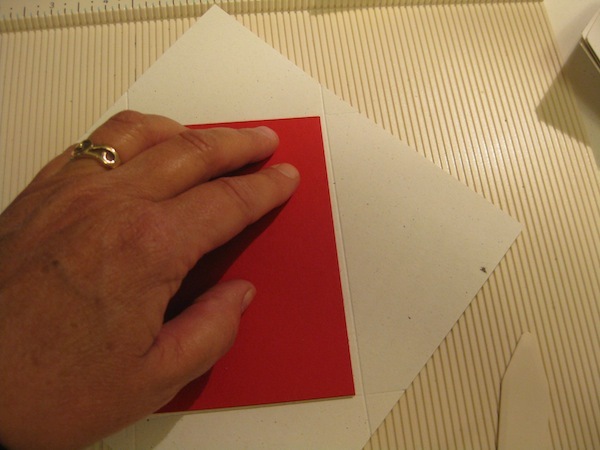 Next was to heat set the embossing powder on the sheets of 8-1/2 x 11 papers. This phase of the work took about 20 minutes. 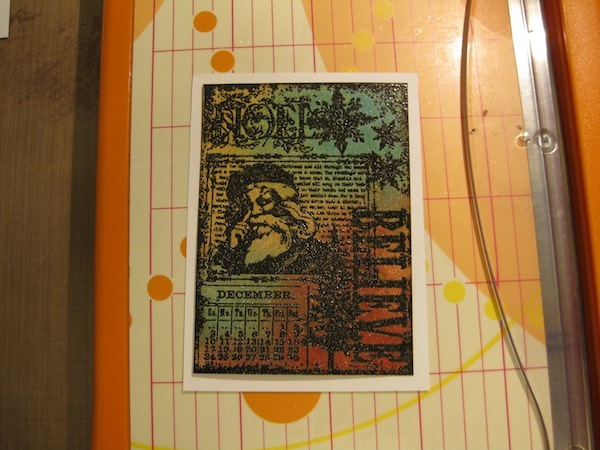 Moving the paper around as the embossing powder melted and trying not to scorch the paper nor burn my fingers. These are the inks I’m using on this project. 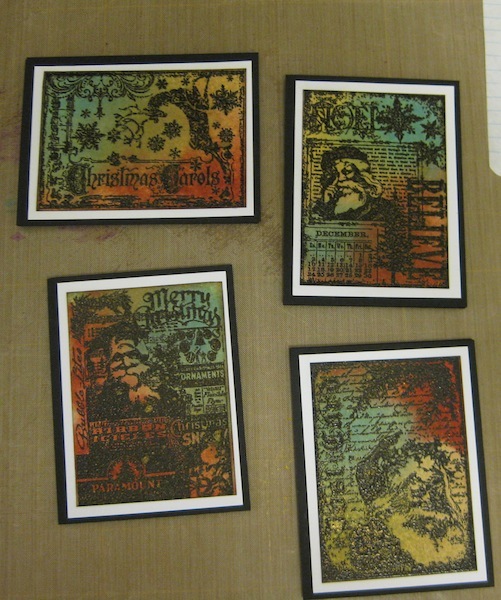 VersaMark for the stamping, Fired Brick, Tumbled Glass, and Antique Lace Distress Stains to “color” the images. I’m practicing the Tim Holtz technique of smearing color around and blending it in. 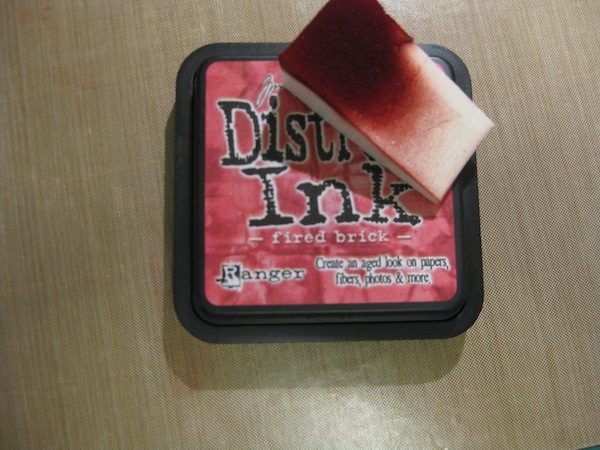 First up is Fired Brick Distress Stain. 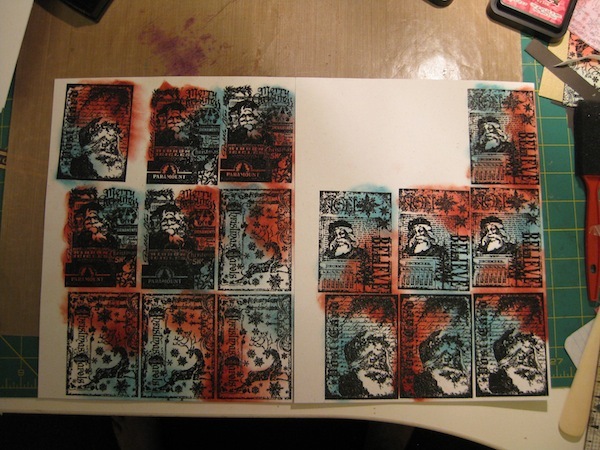 Using a makeup sponge I applied the distress stain in semi random places on each of the stamped and embossed images. 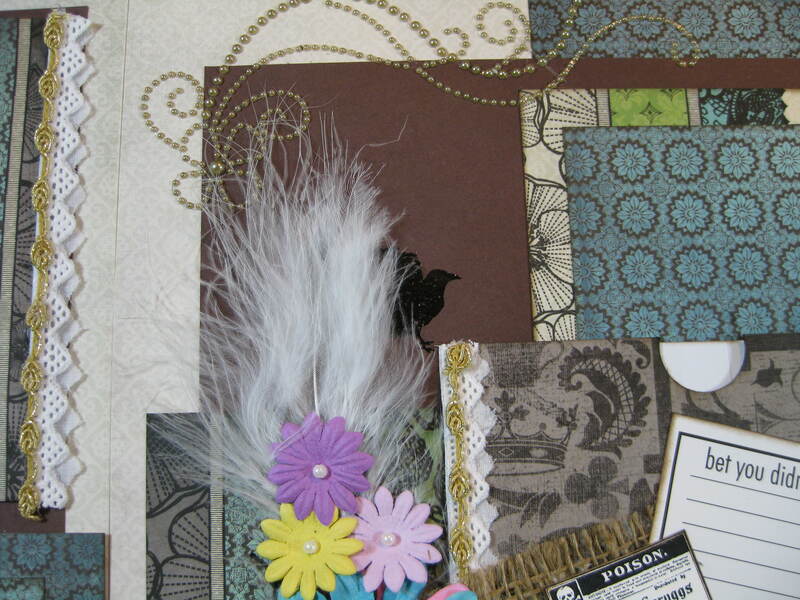 Buff the sponge and color right over the black embossing to get the color down in the open areas of the embossing. 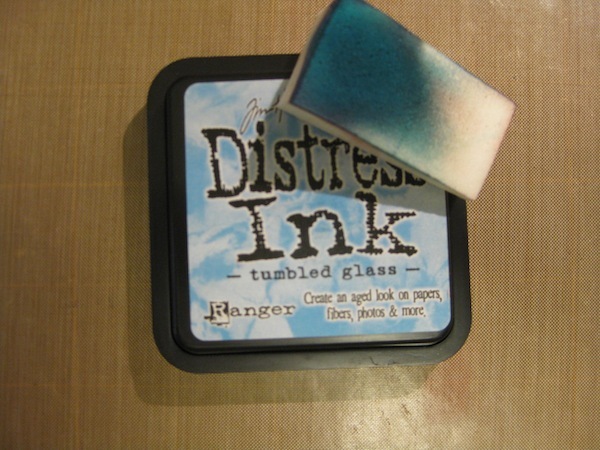 Next was Tumbled Glass and a different makeup sponge. 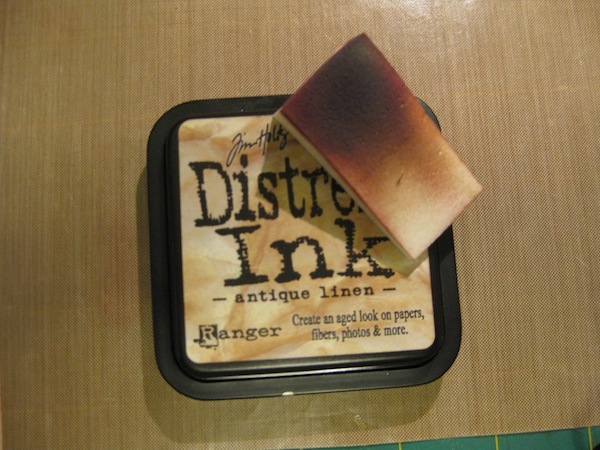 The final bit of inking was with Antique Linen Distress Stain and another sponge. 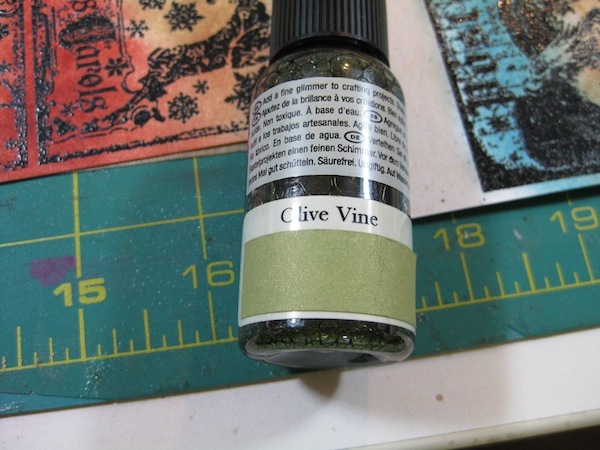 This color was added into the remaining white areas of the stamped and embossed images. Yep. I had the same thought. Crapazoid, this looks all messed up! Some of those Santas look almost menacing with the way they are colored. Yikes! This part of the process took about another 30 minutes to do. Covering each of the images with the three colors – one after another – and adding in more color to some that seemed to have gotten lighter. 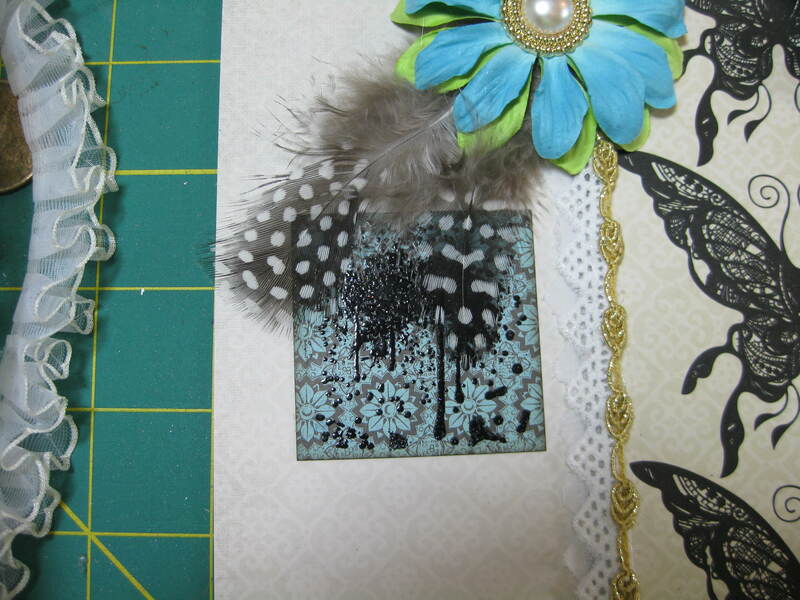 Next I sprayed both pages with some Glimmer Mist by Tattered Angels. This part of the project took about 10 minutes to do. Fussing with where to spray what was the biggest time waster. After the Glimmer Mist dried I used scissors to cut the images from the paper then I used a paper trimmer to get the images cut straight. Once each image was cut out and squared up they didn’t look quite as bad as they did right next to each other. 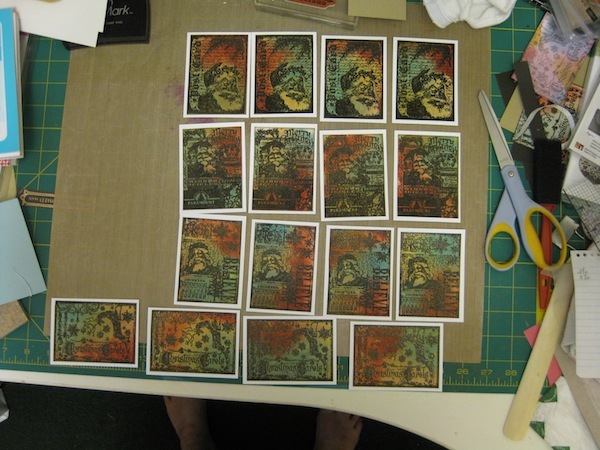 Next was an application of Walnut Stain Distress Ink to the cut edges of the images. These images are so dark I thought they need to have a white border around them. 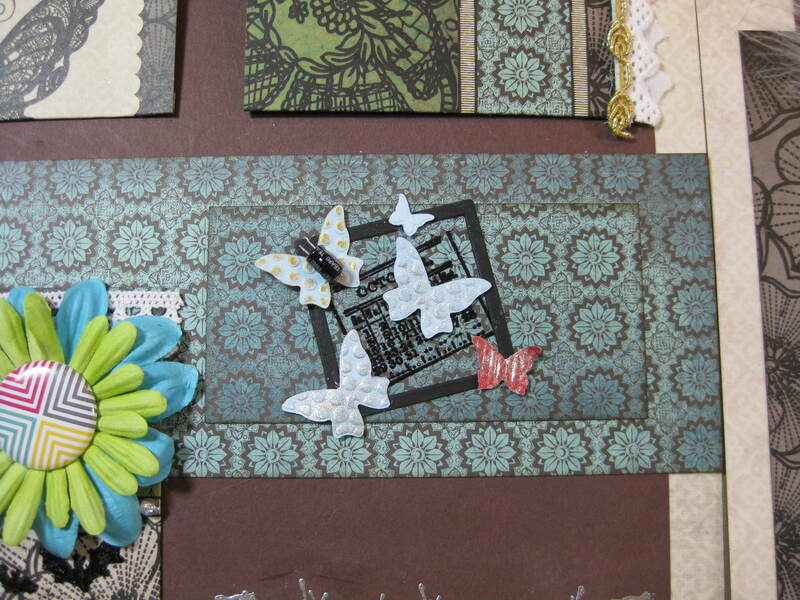 Using some Whisper White card stock from Stampin’ Up! I cut the mattes at 2-3/4″ x 3-3/4″. 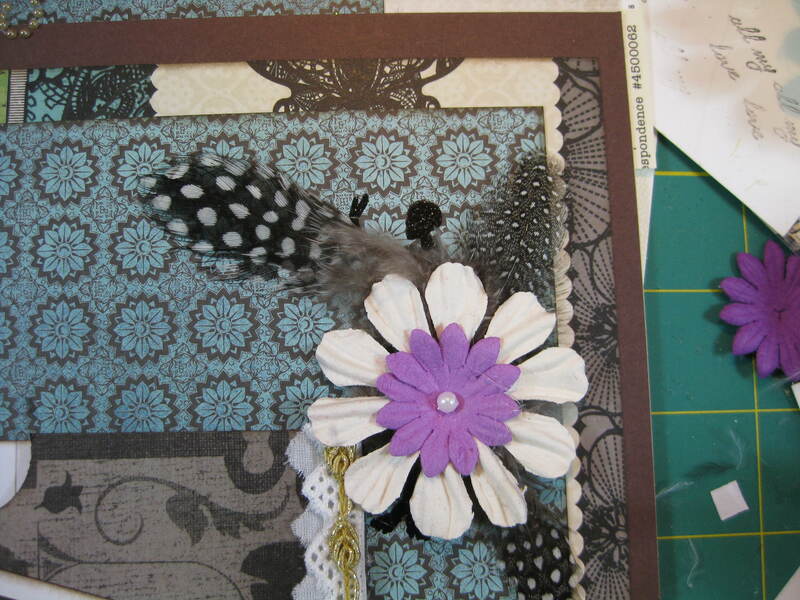 Adhesive was applied to the image and then stuck down to the Whisper White card stock. Looking through my stash of papers I needed to find some black card stock. What I found was a couple 12″ x 12″ pieces of Club Scrap card stock with a print on the other side. I cut this 12″ x 12″ card stock into 3″ x 4″ pieces. 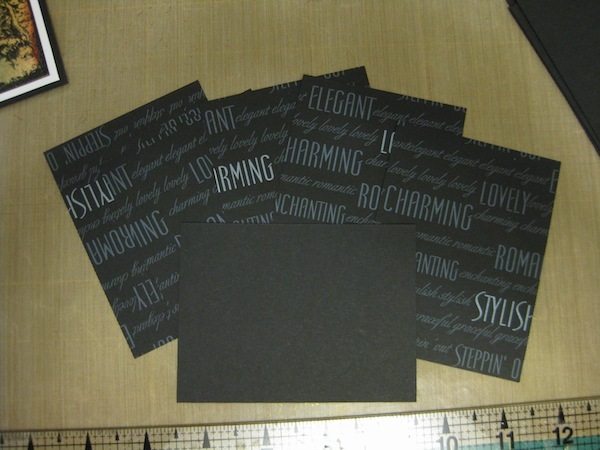 The black card stock will be mounted to the back of the white card stock for another matte effect. 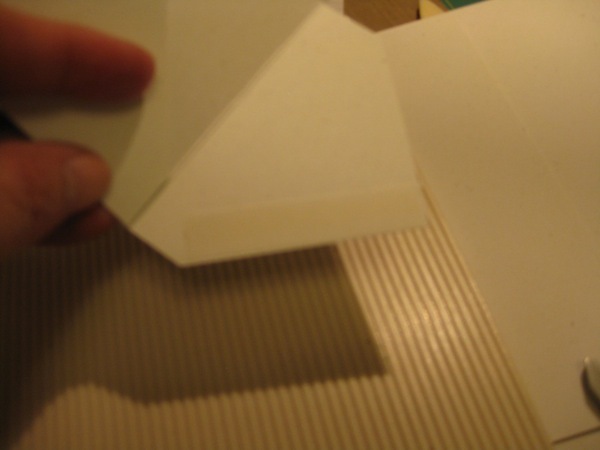 Cutting up the Whisper White card stock, adhering it to the back of each of the 16 images took almost an hour to do. Cutting up the black card stock and adhering it to the white card stock took almost another hour to do. 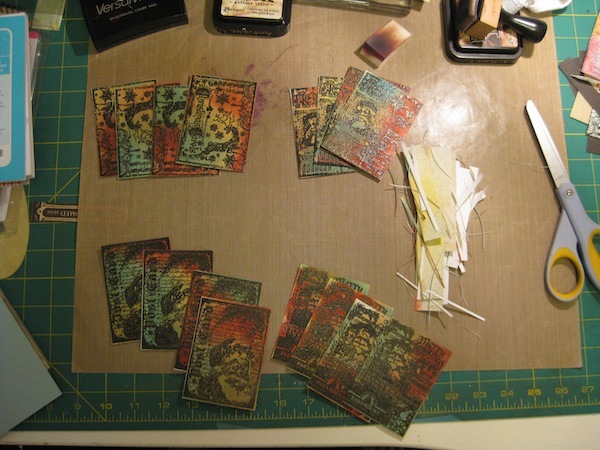 The next part of this assembly line project was to cut and score the card bases. I had to hunt around for eight (8) sheets of 8-1/2″ x 11″ card stock. The first four sheets were a snap to go through. 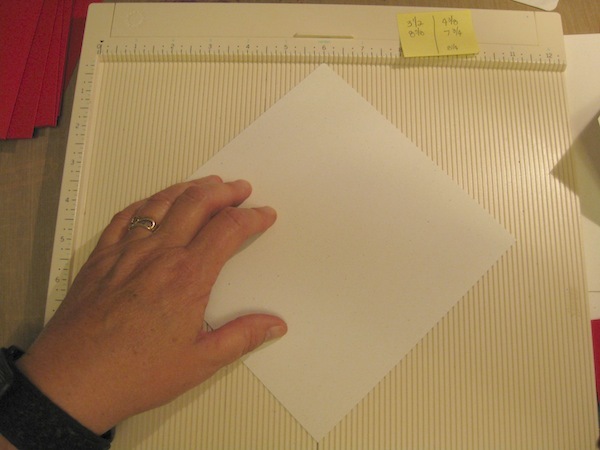 Cut each sheet in half horizontally at 5-1/2″. 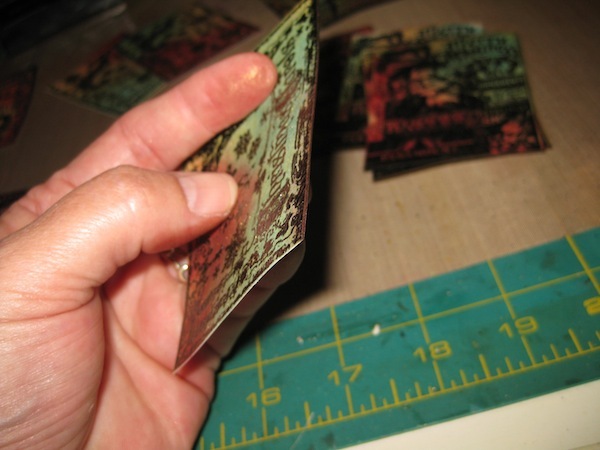 Then score each of the 8-1/2″ x 5-1/2″ card stock pieces in half at 4-1/4″. 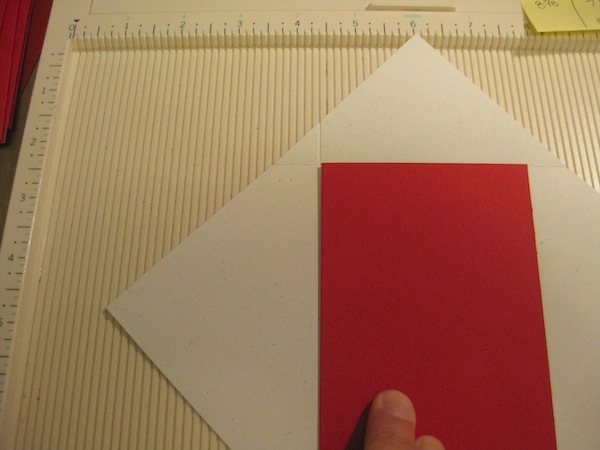 The next set of four sheets of card stock were cut at 4-3/4″ x 6-1/2″ and scored horizontally at 3-1/4″. I now have 16 card bases to go with the stationery kit. This part of the project took not quite an hour to do. This went pretty quickly. I need to get as much done as I possibly can before Monday arrives and more doctor visits for Joe. 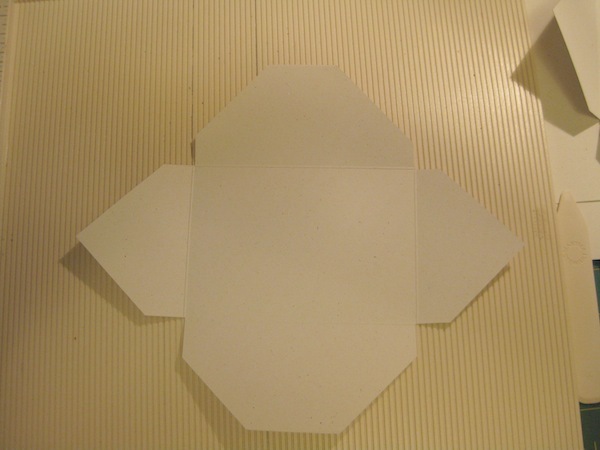 I have envelopes for the standard A2 cards – the 4-1/4″ x 5-1/2″ card bases. 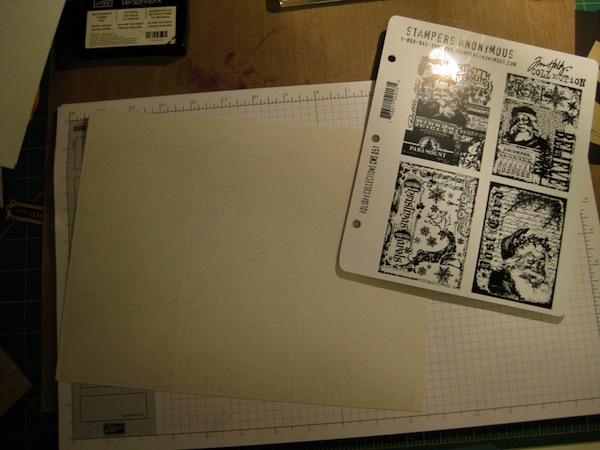 I don’t have envelopes for the 4-3/4″ x 3-1/4″ card bases. I had to make them. 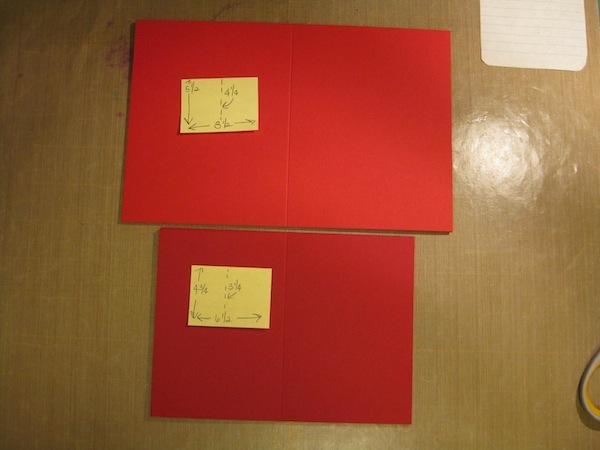 I saw a video on YouTube using the Martha Steward score board to make the envelopes. So I did a “mash up” of my technique and the YouTube video. 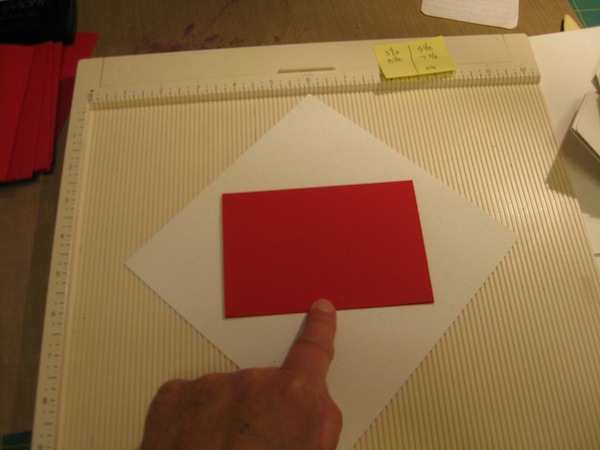 First, measure the card base on the diagonal. Measure from the top left corner down to the bottom right corner. Once you get that measurement you will add one (1) inch. This will be 6-3/4″. I located eight (8) sheets of an off white card stock, similar to what I used to stamp the images on. 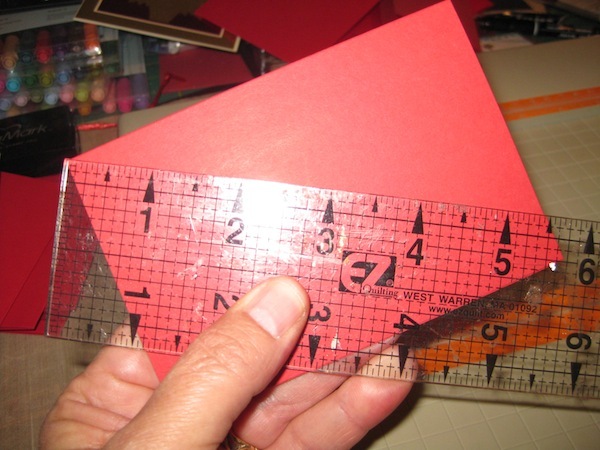 Each sheet was cut at 6-3/4″ x 6-3/4″. With a pencil I drew down the 6″ score line of the Martha Steward score board so I would have a point of reference for the two points of the squared up card stock. The points need to be straight up and down for this to work right. 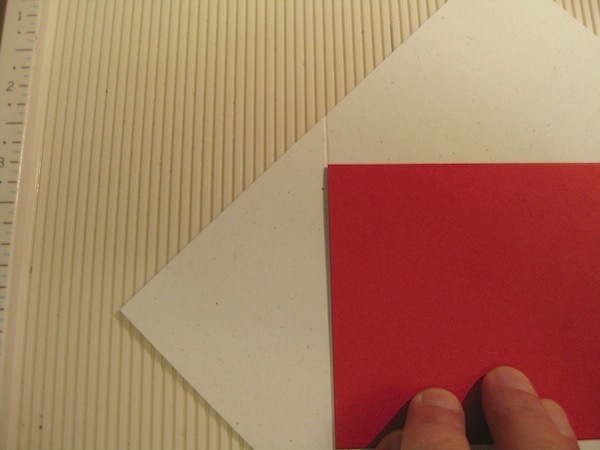 Place your card base as close to be centered on the 6-3/4″ x 6-3/4″ paper. Eyeballing it will get you pretty close to being centered. 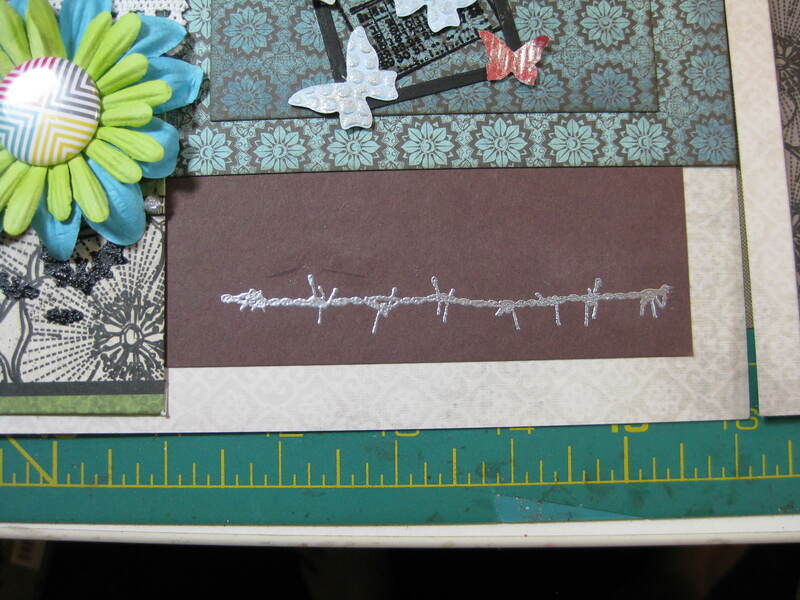 With the scoring tool, place it at the right top edge of the paper near the card base end. Run the score tool up to the top to see where it ends up on the measuring scale. Write that increment down on a piece of paper. Score down the paper at that designated score line. 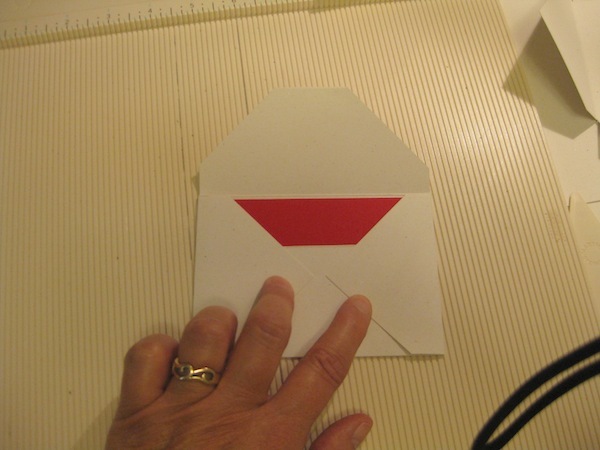 Carefully holding the card base in place do the same with the left side of the envelope paper. Find the score line that is closest to the left edge of the card base. Make sure to go out further one score line. I went right up against the card base and that was way too close. Turn the envelope paper one quarter turn right or left, doesn’t matter. 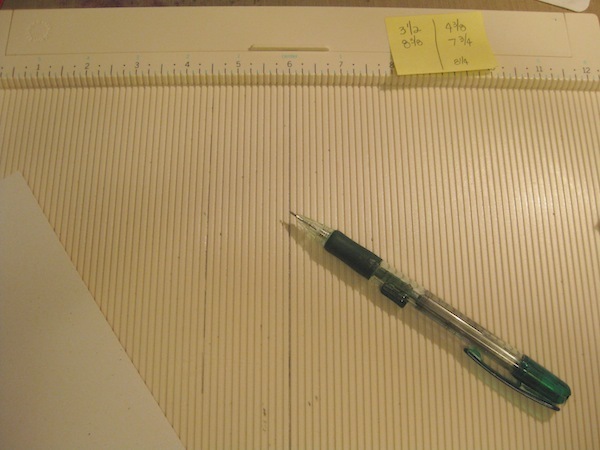 Just get the next point up at the 6″ mark and line up the bottom point with the pencil mark. Score the paper down the closest line to the card base as you can go without being on top of the card base. Next score the right side of the envelope paper close to the card base. Your envelope paper will now look like this with the lines scored through it. 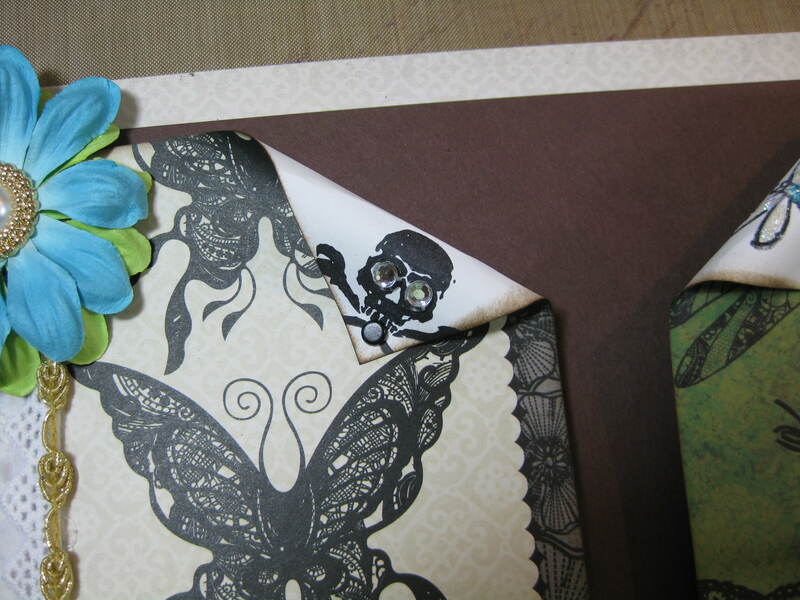 Make sure to write down the score lines you used to create this envelope. Next you will be dealing with the little triangles that will need to be cut away. 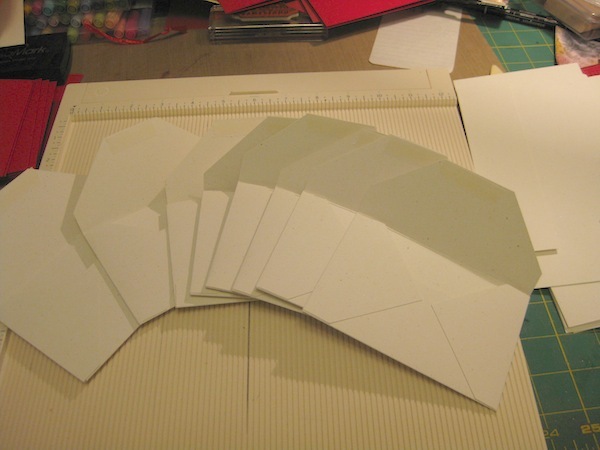 By cutting out these triangles you will be removing BULK from the corners of your envelope. This will give you some really smooth and fabulous corners. Cut on the outer part of the triangle. 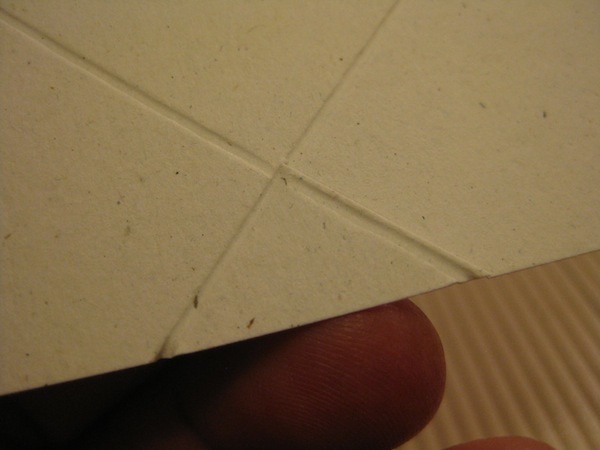 Remove the creased edge of the triangle. 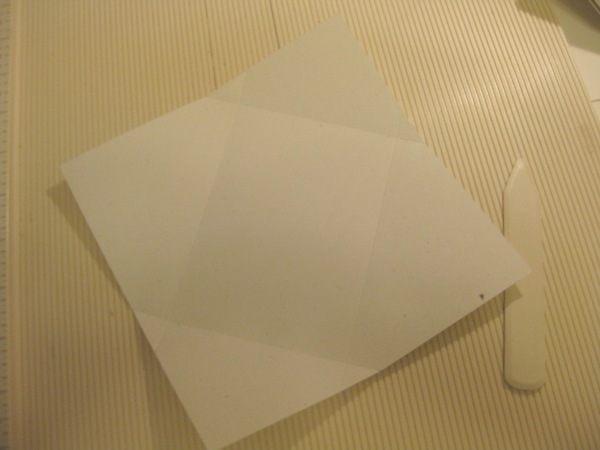 Once you have finished cutting out the triangles your envelope will look like this. 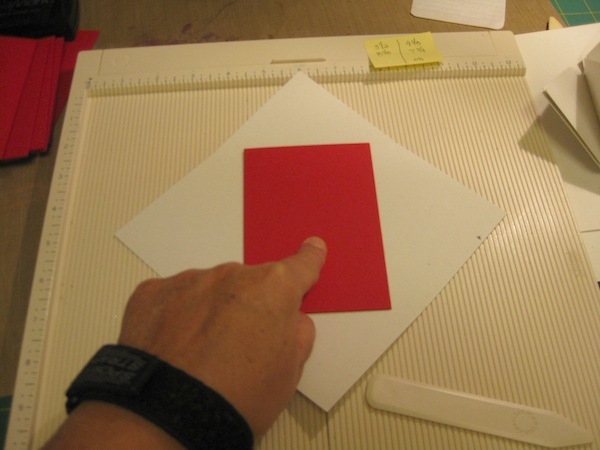 Align the score mark for the bottom edge of the fold up area with the pencil line on the score board. Decided where you want the point cut off and score that line. 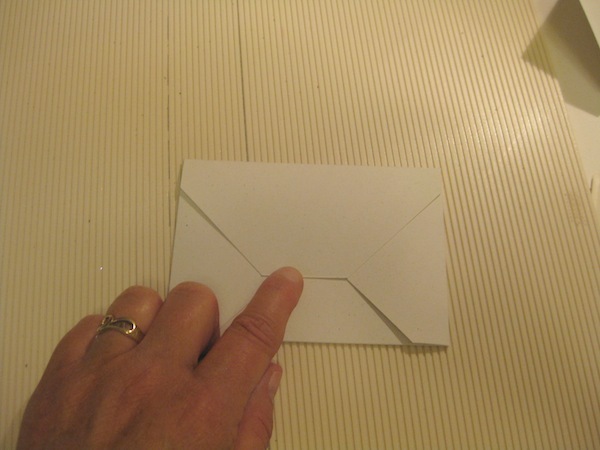 Turn the envelope around to the other side and do the same thing. Score the area you want to cut away on the flap. Cut away the score mark and your envelope is just about finished. Your flat flaps will look like this. 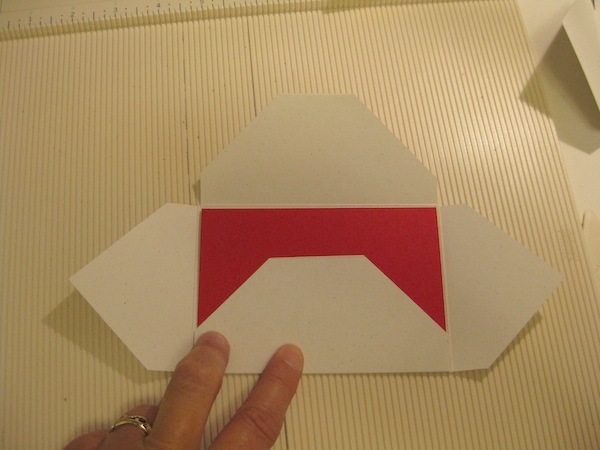 Test fit your card base into the envelope. 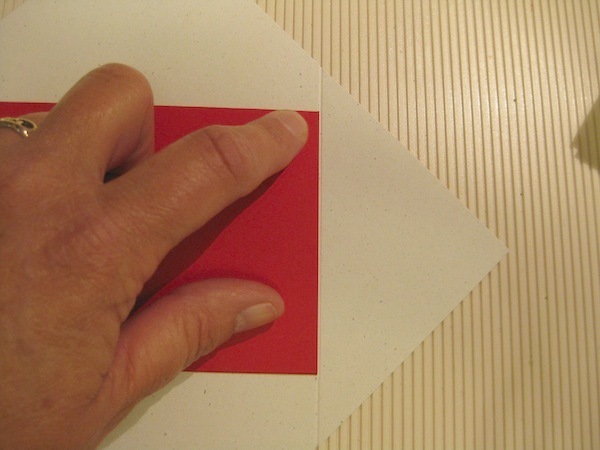 Close up the envelope around the card base without using adhesive. 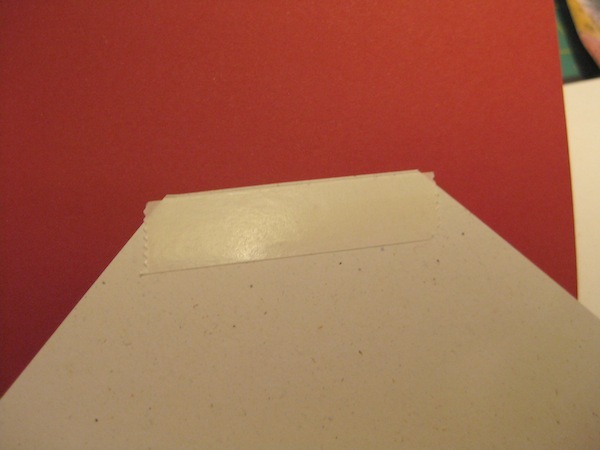 Apply adhesive to the side flaps at the bottom edge to the point. Sorry, I don’t have any photos in focus of this procedure. Fumble fingers! 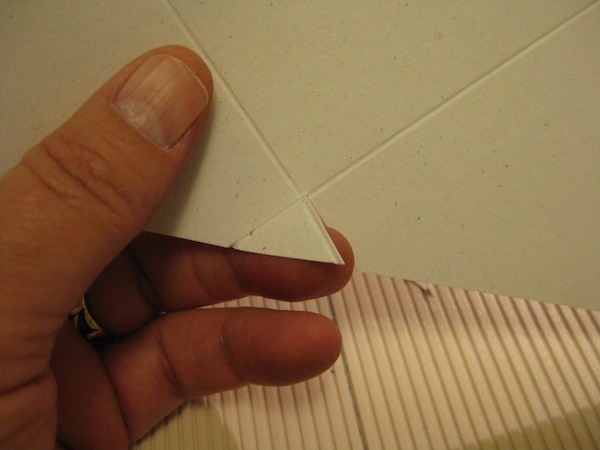 Once you have our envelopes all put together then it is time to add an adhesive strip to the closure part of the envelope. It is IMPORTANT to leave the protective paper on the adhesive. You don’t want the envelope to stick shut after all this hard work. A stack of envelopes ready for the cards to be finished. That is all for today. More than enough for one day. I think it is time to go check on Joe and see if he feels like a “Scrap Widower”. The envelope creation of this project took several hours to do, about three hours to be exact. I may have to pack a basket of supplies to take with me to the doctor appointments with Joe this coming week. Have something to do while he is being examined and getting his stitches removed. 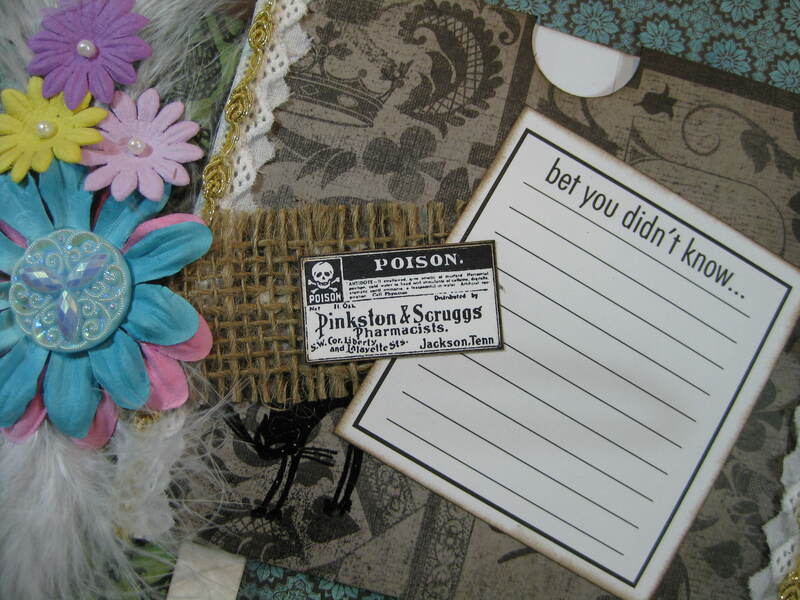 I still have to create the 3″ x 3″ note cards and envelopes and the gift tags for this box of goodies. I think I can keep myself occupied this week 😀 Yes, and I also need to decorate the lid of the box. So much yet to do! Those of you in the US that are preparing for Thanksgiving this coming Thursday I ask that you take a moment to consider what you are thankful for this year. I have a lot to be thankful for. I will end this post with a bit of gratitude. I am thankful for the doctors that have taken care of my Joe this year. The care shown by them and the knowledge they have to combat the pulmonary embolisms he suffered through and the appendicitis recently, plus all the other doctors that keep track of him and make sure he is on the way to wellness. I appreciate each of them. Alrighty then. This two page layout was quite a challenge for me. 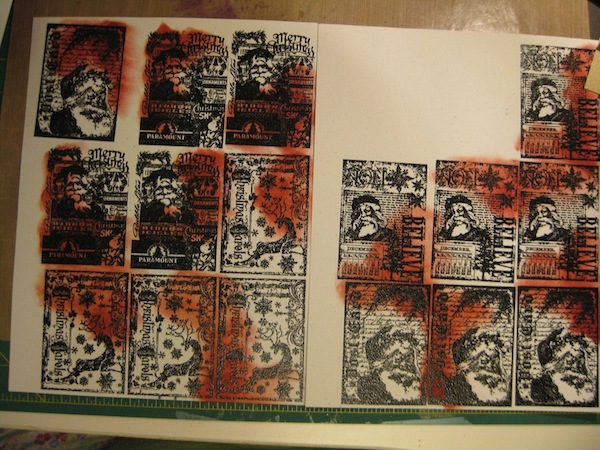 How best to add the stamped images to the layouts but hide them in such a way that they don’t take over the pages and turn them into something I didn’t want….a Halloween layout. 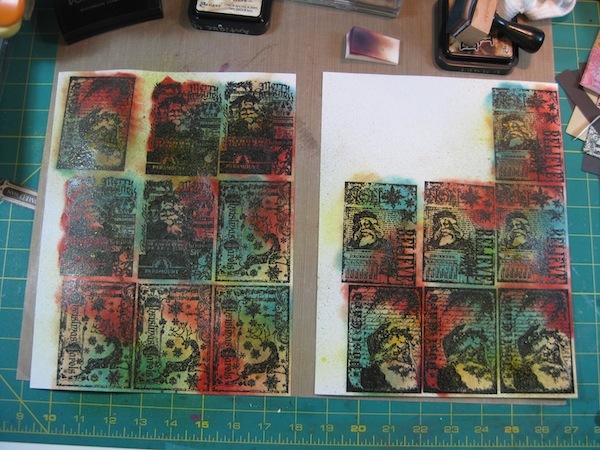 This is the stamp set I’ve used. 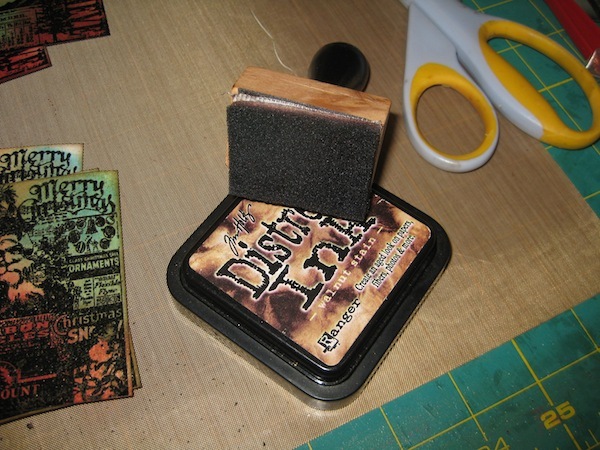 Tim Holtz Stampers Anonymous “Mini Halloween”. There are 10 images used in the entire two page layout. The Disney-Pixar movies are leaden with “Easter Eggs”. They have done so since the first digital movie they made and continue to do it. It has gained attention and there are movie goers that have one aim: Find the “Easter Eggs” in the movie. These little gems are well hidden in the scenery and go virtually unnoticed by most people. Pixar Easter Eggs. 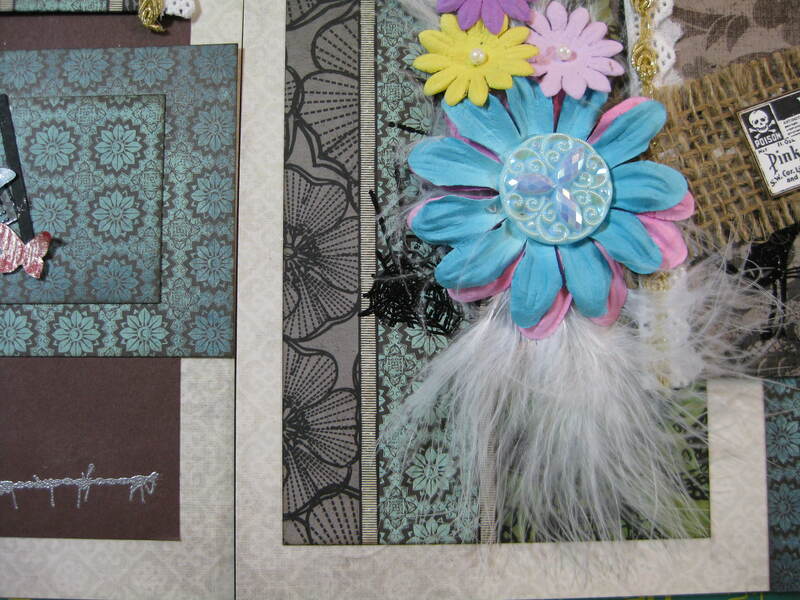 This two page layout is for Tiffany’s letters, cards, money gift card notes, and all the things she treasures. Many families she has dealt with has shown their appreciation for her professionalism and her skill in helping them say their final good-byes. On the left page are three pockets she can tuck things in. The pockets are made from the 4″ x 6″ photo mats. 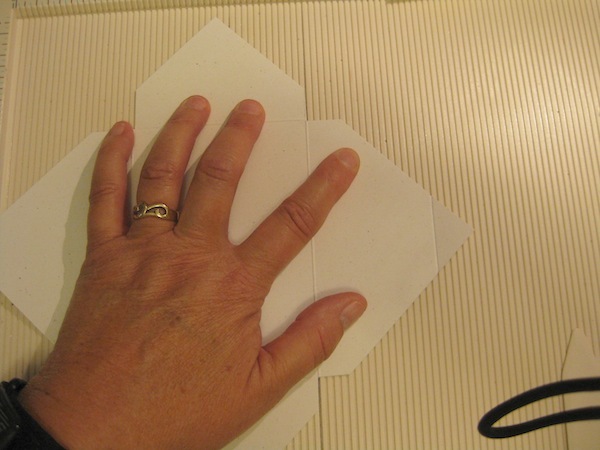 I’ve used my Martha Stewart Score Board to make folds 1/4″ wide along the left and bottom of the left most top pocket; right and bottom of the right most top pocket; and the right and bottom of the bottom pocket. I’ve used sticky strip to hold the pockets in place. Turning the top corners down on the upper two pockets to allow easier access to tuck away her treasures. 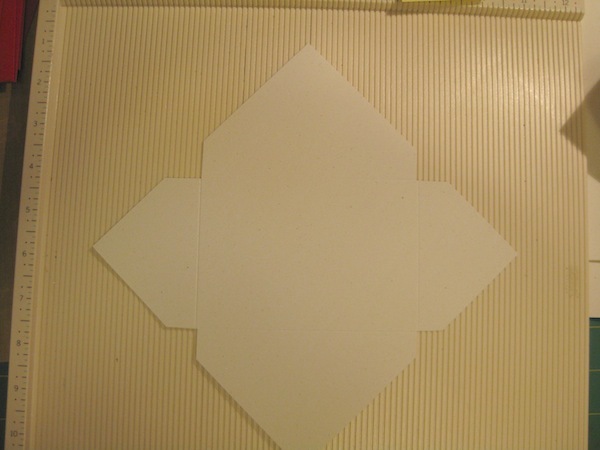 On the right page I have taken a 6-1/2″ x 9-1/2″ mailing envelope and cut it down to less than 5″ and covered it with paper from the DCWV Street Lace papers. I’ve attached the envelope using sticky strip. 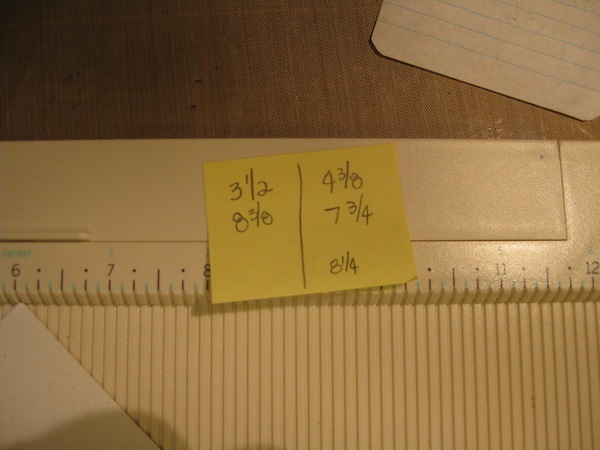 A “thumb” notch was cut out using my 1″ hole punch. Have you found the hidden images? Do you need some help? The following images are on the left layout page. The button in the flower center is from Shelly (tachar). When I finally got to meet Shelly and Brian last year she blessed me with a baggie chock full of things. The following images are on the right layout page. The button used in this flower center is, also, courtesy of Shelly’s largess. Thank you Shelly for your gift to me. This was totally fun! Took a bit of thought but I had a blast. Is this something you would like to try? If you do, please leave me a link to your blog post showing your “Easter Egg” hunt pages. I’d love to see what you do to your creation.